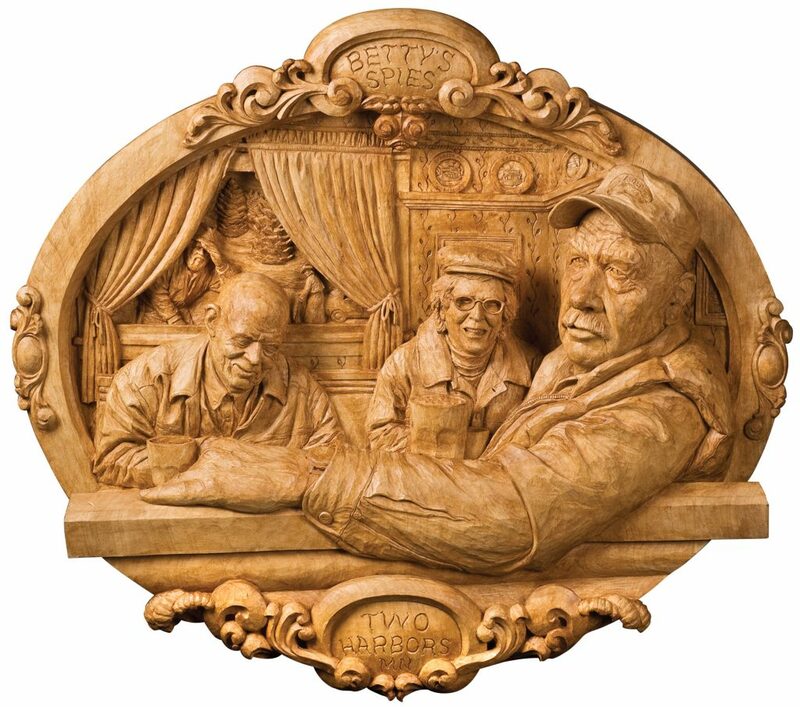 Fred often carves in a style he calls mezzo relief, which falls between and combines high and low relief. He enjoys warping the visible planes and perspective, compressing elements, and undercutting. 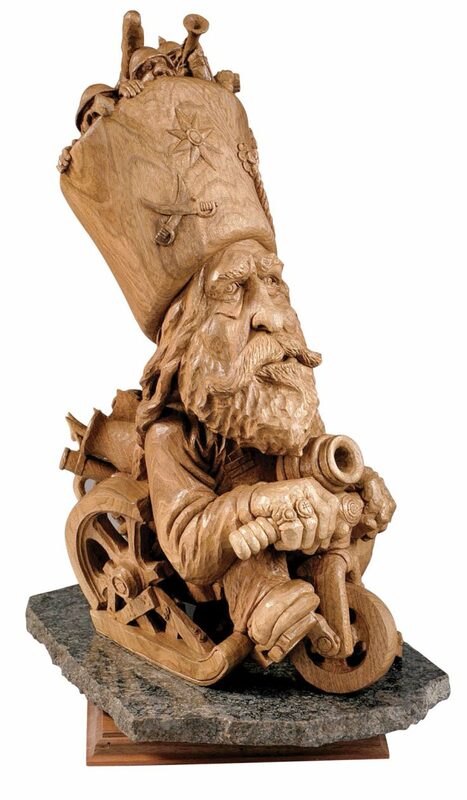 Betty’s Spies, a piece that won Best of Show at the 2010 International Woodcarvers Congress (IWC) in Davenport, Iowa, is a good example of Fred’s style. Technically a relief because the back is not carved, the piece uses undercutting, perspective, and a judicious time-space warp to create a 3-D scene, even though the piece is only 3-3/4″ deep. 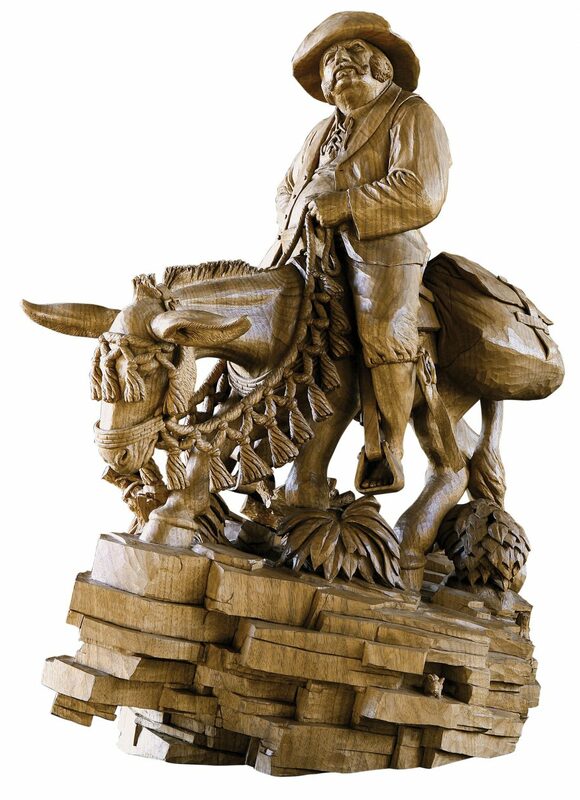 Some of the people in the carving are realistic, while others are distorted or caricaturized. The background is carved in low relief. That said, Fred is no stranger to in-the-round carvings and has won several awards for his nearly life-sized busts. He averages 15 to 20 smaller pieces and four to five large, often life-sized, pieces each year. Carving most often in butternut, Fred occasionally draws on his political science background to create pieces of carved social commentary, such as Rest Easy Tonight, a piece Fred says represents the reaction the country had after the September 11 attacks. Among the “other things” last year was an exhibit called What Doughn’t Kill Ya… sponsored by a California real estate executive with ties to Fred’s hometown. He purchased one of Fred’s pieces and suggested that the artist put together a show of a half-dozen new mezzo-relief portraits. Fred completed the pieces and attended events in Utah and Colo. Entering competitions also keeps Fred busy. 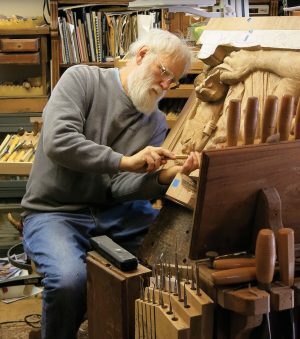 He consistently wins top awards at the International Woodcarvers Congress and has won an impressive 12 Best of Show awards there since he entered his first piece in 1978. Despite his commercial and competition successes, Fred has mixed feelings about teaching his art. “I kind of enjoy the seminar experience,” he said, “but I don’t feel really fulfilled because I’m not sure I’m a good instructor. I always feel like if a person is ready to be a student or apprentice of mine, the person is ready to be out on his or her own, carving.